But a tribute is due, and here’s mine. It’s an adaptation of a profile of Jim that was part of my book, Without Apology. In a treatise entitled Goatwalking, you might not expect liberal Quaker “prophecy” to be a prominent theme. But in the case of Jim Corbett’s stunning book, you would be mostly mistaken. I say mostly because it’s hard to characterize Goatwalking–or its author. If I call him a prophet, it is not because he pens jeremiads. Corbett was a gentle man, retiring, soft-spoken, grizzled by desert sun and wind. He worked as a rancher, cowboy, horse trader, librarian, shepherd and wilderness guide. He also breezed brilliantly through college in three years, and finished a masters in philosophy at Harvard while spending most of his time partying. He cited the classics of Western–and Eastern–thought with the same familiarity and confidence that he explained how a human can become part of the society of goats. In the course of his “errantry” (one of his favorite terms, which means a quest for personal and spiritual adventure, best exemplified by Don Quixote), there were ups and downs: Corbett once considered suicide, he says, after a series of personal setbacks in the early 1960s. But instead, after an unexpected personal mystical experience, he chose to live, and then “turned Quaker” as the best expression of his renewed view of life. He eventually settled south of Tucson, Arizona with his wife Pat, and attended Pima Meeting. Corbett was by no means a conventional social activist. But one night in the early 1980s, he volunteered to help find legal assistance for a Salvadoran refugee arrested by the Border Patrol. But before he could file the required forms, the Salvadoran was abruptly deported, in defiance of the U.S. government’s own current laws. Corbett was shocked, then galvanized. From this spontaneous effort to respond to the refugees’ plight sprang what became the 1980s Sanctuary movement. The movement was not unlike the later Occupy upsurge, only more low-profile, and based in religious communities. Decentralized and officially leaderless (Corbett was the inspiration and catalyst, but he never held any formal position in the movement, and worked to keep it a decentralized network of religious communities), Sanctuary eventually involved hundreds of churches and synagogues across the U.S., and helped thousands of refugees who fled massacres and wars in Central America — wars that were mostly supported by the U.S. government policy. As part of this policy, the refugees were mischaracterized as “economic migrants,” and many were deported, with more war and death waiting for them. 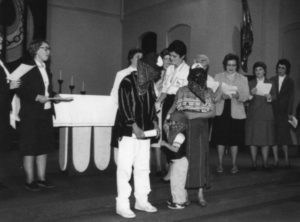 A community of American nuns welcome Central American refugees, masked to avoid identification by clandestine federal agents. The nuns accompanied them to safety, which for many meant going all the way to Canada. 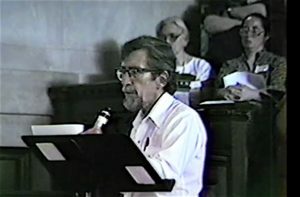 The saga of the 1980s Sanctuary movement is something of an underground epic, a counter-narrative to the triumphalist “Morning in America” posturing of the Reagan-George H.W. Bush years. And predictably for the times, as the movement developed, it first put Corbett’s weatherbeaten visage on national TV, and then got his name on the FBI’s wiretap list. Federal prosecutors worked long and hard to put him behind bars, in one of the more significant political trials of the 1980s. The effort misfired, it turned out, because a wiretap recorder had run out of tape just at a point where Corbett was on the phone making self-incriminating plans to rescue more refugee families. 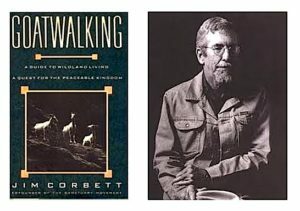 Before these encounters, however, Corbett spent years in the practice of Goatwalking‘s title: wandering arid rangelands with a herd of goats. On these excursions, he and the herd became a part of the natural landscape, moving outside the standard, schedule-obsessed, nature-dominating way of life most of us lead most of the time. 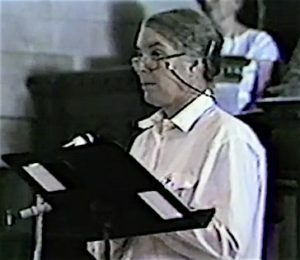 Pat Corbett, at FGC in 1986, describing some of the very practical aspects of sanctuary work. This was precisely the point, of course; but they couldn’t bear it. How many of us could? 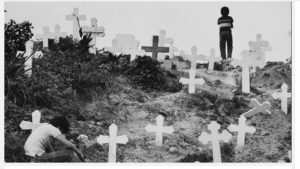 It was Corbett’s intimate familiarity with the Arizona-Mexico border country that made him invaluable in the early days of what was to become the Sanctuary movement. Indeed, it made him the movement’s founder, as much as anyone. And it was the religious encounters he had then, while working to help Salvadoran and Guatemalan refugees crossing the Arizona border to escape from the bloody wars raging there in those years which brought about another major personal turnaround for him. 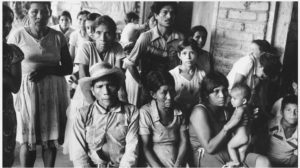 Fleeing imprisonment, torture and death in their homelands, the refugees all too often faced imprisonment, torture and death in the Mexican underworld, or prisons there and in the U.S.–not to mention the prospect of deportation back into the hands of bloodthirsty military governments from which they had fled. As the refugees kept coming, Corbett kept working with them. Soon he traveled anonymously through Mexico and into Guatemala, tracking hunted exiles. More than once he narrowly escaped capture by hostile authorities. In these journeys he came to know not only the victims, but also people from many different churches who were dedicated to aiding them. Once he joined a priest in a visit to refugees in a filthy Mexican prison. The priest introduced Corbett as “Padre Jaime,” and explained that the gringo’s non-clerical language and gestures were characteristic of his peculiar order, La Sociedad de los Amigos. Later the priest even introduced him to an archbishop as un quákero muy católico–a description which Quaker theologian Robert Barclay would likely have approved. “During recent weeks,” he wrote in a letter to friends in mid-1981, “I’ve been discovering this catholic church that is a people rather than creed or rite, a living church of many cultures that must be met to be known. Corbett differed from Barclay on one major point, in that for him the church is not primarily a collection of individuals, but rather “a people of peoples.” It is an organic network of persons working from within traditional structures that are meaningful to them, with people in other faith groups, for common purposes, or in a common pilgrimage in response to a common call. Perhaps a useful metaphor for this might be a patch of wildflowers, variegated in color, size and form, yet all leaning parallel under the breath of the same invisible wind. Yet if words are hazardous, we are not without images. The model for this process also comes from the Bible, in the molding of the heterogenous Hebrew tribes into the people Israel at Sinai by their response to the divine calling mediated by Moses. This models the committed community, cutting across lines of culture, denomination and philosophy, which constitutes “the church,” Corbett concluded. Unbelievers, he added, like himself. What? Jim Corbett, this quakero muy catrolico, an “unbeliever”? Corbett pointed out that the biblical faith, as embodied in the first three commandments brought down from Sinai by Moses, put opposition to idolatry at the top of the list; and in the Book of Job, the smooth conventional theologizing of Job’s friends is relentlessly debunked, showing that idols include not only statues or golden calves, but concepts of God–dogmas and theologies–as well. This is in stark contrast to many other passages, and to orthodox theology, where God is spoken of as all-Good. Such biblical demythologizing of the Bible itself, Corbett said, reaches its zenith in the Book of Job, where the notion that God must be only the source of good is completely undermined. In a modern parallel, Corbett noted a report that some rabbis in Auschwitz put God on trial for injustice and pronounced a guilty verdict. To sum up: Corbett encountered in the Sanctuary movement a new manifestation of authentic religion, which takes form in communities that respond to the leadings of an unimaginable but real presence which theologians typically call God. These communities, especially as they work together, moving in concert even while maintaining their specific identities, make up the true, “catholic” church, cutting across lines of dogma, denomination and culture. For Friend Jim Corbett, and many faith communities in the borderlands of the American Southwest and elsewhere, these texts came vividly alive as they joined in the work of providing sanctuary for some of the thousands of refugees fleeing the horror of war in Central America. I smiled at that. How thoroughly Jim to mix Jewish mysticism with cows. But if anybody could do it, he could. And he’ll make it good to, I bet. I’m anxious to read it. Note: Jim’s second book was published in 2005 as, Sanctuary for All Life: the Cowbalah of Jim Corbett. More information here.